Pears are one of the highest-fiber fruits, offering six grams per medium-sized pear. Their high-fiber content helps reduce the risk of heart disease as well as type 2 diabetes. Research suggests that pears may even reduce the risk of developing certain cancers including colorectal, stomach, and esophageal cancer. 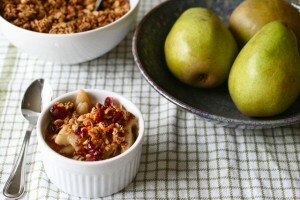 This pear crisp recipe uses almond flour and coconut oil to create a healthy dessert without sacrificing taste. Almond flour is gluten free, and high in monounsaturated fats and vitamin E. Coconut oil can boost thyroid function helping to increase metabolism, energy, and endurance. With all of these nutritious benefits, you can really sit back and enjoy every spoonful! 2. Place topping ingredients in a food processor with the large S blade. Process until you have a uniform consistency for your crumble topping. 3. Place all filling ingredients in a 8”x8” glass or enamel baking pan and toss together. 4. Crumble the topping evenly over the filling. 5. Bake 35-45 minutes or until the fruit is fully cooked and juices are bubbling. Option: Mix the filling in a bowl and cook this tasty treat in individual ramekins.